Have you ever purchased an item and regretted your decision because the price dropped shortly after? Fortunately, credit card price protection may be able to help you recoup your losses. If you find a lower price on an item purchased within a specified window of time, the credit card company will issue a refund for the difference. However, taxes, packaging, shopping and other applicable fees are not eligible for a refund. The credit card agreement will clarify the applicable time frame. You should also confirm the item in question is identical prior to requesting a refund. The credit card price protection program varies by credit card issuer. You will need to call the customer service department to confirm your eligibility and learn more enrollment process as it applies to your specific card. 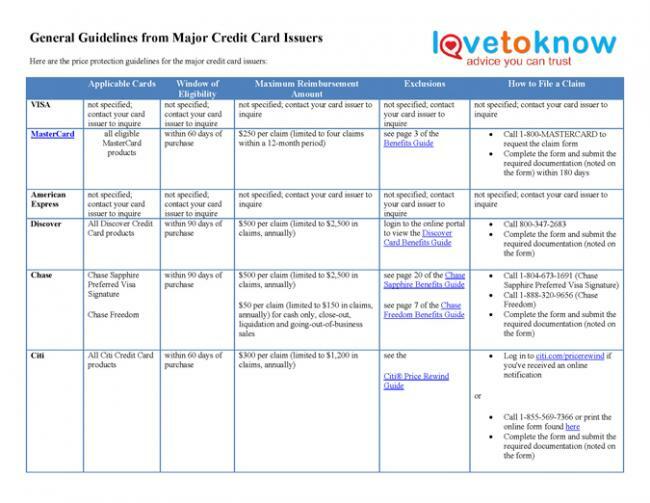 Below are the price protection guidelines for the major credit card issuers. Click the image to download. If you experience difficulties, please see LoveToKnows guide for Adobe printables. Before applying for your next credit card, read the fine print to see if it offers price protection. If so, you can rest assured that you can still save money on your next major purchase if you find a better deal after the fact.